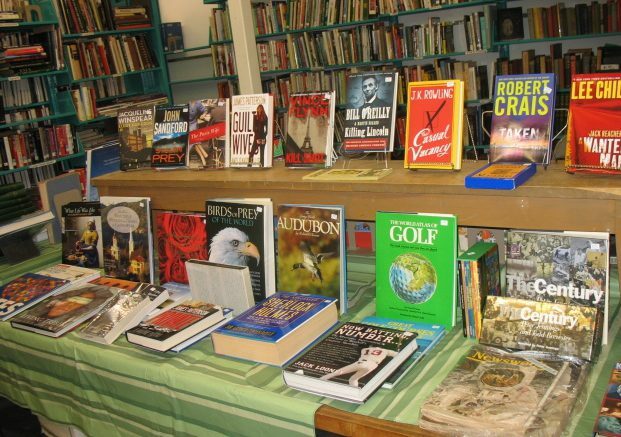 Press Release posted 1/27/19 – The upcoming Friends’ BEST USED BOOK SALE will be held on Friday, February 1 from 3:00-7:00 p.m. and Saturday, February 2 from 10:00 a.m. – 2:00 p.m. Featured this time will be our annual VINTAGE collection. We will have a large amount of attractive and valuable classic books for sale on the Basement table and on our shelves. In addition, there will be some fascinating historical sets such as the 1918 set of True Stories of the Great War and Jefferson and His Time, a study of all things Jeffersonian, as well as Carl Sandburg’s biography of Abraham Lincoln. A beautiful collection of The Bibliophile Library of Literature, Art and Rare Manuscripts (DeLuxe Limited Edition) will also be available. For fiction, we have a set of Charles Dickens books and The Works of Edgar Allan Poe. Look for classics with vintage drawings and illustrations and some charming children’s titles with beautiful artwork as well as our usual collection of Nearly-New books on the Basement shelves. The Parking lot will also feature a number of Vintage books in our Bargain Book boxes where you may find old favorites for only $1.00. Small paperbacks are $.25 each or 5 for $1.00 and Children’s and teen books are priced from $.25 – $1.00 in the parking lot. DVDs, CDs and Audio Books will be HALF-PRICE at this sale. AND DON’T FORGET OUR SATURDAY BAG SALE IN THE PARKING LOT. Fill a large grocery bag all day for only $5.00! !